CD review: "Rock Out!! And Stay Awhile"
This review first appeared in the August 10, 2006 issue of the North County Times. 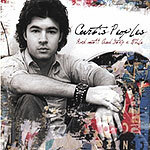 Rock-powered pop with a well-honed edge, former San Diegan Curtis Peoples' new CD is a likable bit of winsome melodies wrapped in an alt-rock attitude. Peoples  who has relocated to Hollywood after a childhood spent locally  is on tour nationally supporting "Rock Out! And Stay Awhile." Possessing an attractive mid-range baritone, Peoples sings with a casual informality that feels like a friend sitting in your living room playing a new song for you and your roommates. Stylistically, the album is in a singer-songwriter mode with a touch of alt-rock nasality to People's singing. But there are also touches of R&B and arena rock; he seems to borrow whatever elements will work best on any individual song. If there's a complaint to be made about this album it's that at times the arrangements and production are a bit too slick. Given the strong melodies in the 10 songs Peoples has written for this album, it's a bit bewildering as to why he would want to clutter some of them up so much.